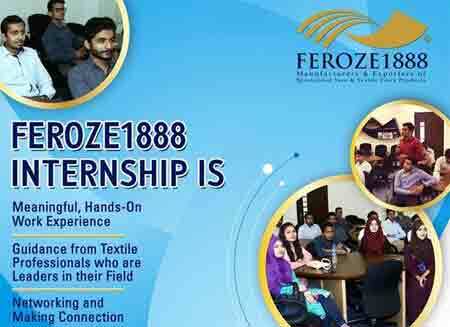 Feroze1888 mills limited is one of the leading textile company in Pakistan, feroze1888 starts taking summer internship applications for year session 2018. The candidates who want to make their career in textile field its batter chance for those candidates to get this summer internship certificate, under this summer internship program the professionals from feroze1888 will be provide training in textile industry to boost the career level of fresh graduates. Summer internship training program will be meaning full hands on work experience. The professionals from top level textile industry will give the professional training to make the future leaders in the field of textile. Guidance from Textile Professionals who are Leaders in their Field, Networking and Making Connection. Starting 20th June 2018 Application deadline: 20th May 2018, send your CV at internship@feroze1888.com, Learning does not get completed unless it is merged with true spirit of industrial experience. This summer Feroze1888 offers you opportunity to polish your skills and get hands-on with industry experts. Students of Textile, Electrical, Mechanical, HR and Supply Chain disciplines are eligible to apply for 6 weeks internship program. With latest machinery and well equipped labs we offer you the opportunity to make a real difference to the world of textiles. www.feroze1888.com.